I can't believe September is almost over already. It seems like only a couple of weeks ago since I did my July Loves post! That one seemed to be quite popular so I think I'm going to do "loves" posts every other month, as the products I'm loving don't usually change too much on a monthly basis (I wouldn't want to bore you mentioning the same products over and over again either!). This month I have a selection of favourites that, for the most part, I haven't talked about on the blog before. I'd had my eye on Balance Me Cleanse and Smooth Face Balm for quite a while and mentioned I wanted to get this in my August wishlist. This cleanses, gently exfoliates and removes make-up sooo well. I only tend to use it every couple of days though as exfoliation every day is a bit much for me! After cleansing with the Balance Me Balm I've been using Michael Todd's Charcoal Detoxifying Face Mask (reviewed here) a couple of times per week. My skin has been a bit problematic recently thanks to stressing out a bit too much, but this mask has been really helping to keep my skin from getting too dry and I've found it also helps clear up blemishes more quickly. There's a few items of makeup that have really impressed me recently, two of which are from UNE, which is Bourjois' natural makeup range. UNE's Lip-Toned Colour in L02 is one of those "your lips but better" shades, very natural looking but can also be built up if you want a bit more colour. Almost identical in shade is UNE's Breezy Cheeks Blush in B03. It's a cream-to-powder blush which I assume to be very similar in consistency to the widely talked about Bourjois Cream Blush. It's just so easy to apply and blend that I can't help but love it! Finally there's the Jane Iredale Pencil Eyeliner in Basic Black. I have really sensitive eyes so I hadn't worn eyeliner on my waterline in such a long time, but this is one of the few eyeliners that I can wear with no problem as doesn't irritate my eyes at all! I can't fault it to be honest. I think I may be starting a love affair with Jane Iredale products! My loves list just wouldn't be complete without a little bit of blog love, so there's a couple of blogs I wanted to mention this time around that I would recommend checking out! Mary's blog Pure Makeup is another one that I always find myself reading every post! Her blog has an exclusive focus on natural beauty products and was one of the first ones I followed when I started using more natural products. Her reviews are always really useful and informative and she talks about a huge variety of brands, some of which aren't actually available in the UK but I now have a list of things I want to pick up if I get the chance to visit the USA at some point! I love Michael Todd products, but haven't tried that one yet. I'll have to order it soon and try it out! would love to try the Michael Todd range but I'm still too skeptical about international shipping. The packaging is so pretty, I must say. I'm glad you like Une products! I love their concealer but very rarely hear people talk about them! Lovely products reviews! i quiet like the UNE's brand and this blusher sounds very nice. I bought a creamy eyeshadow not too long ago and i loved it. 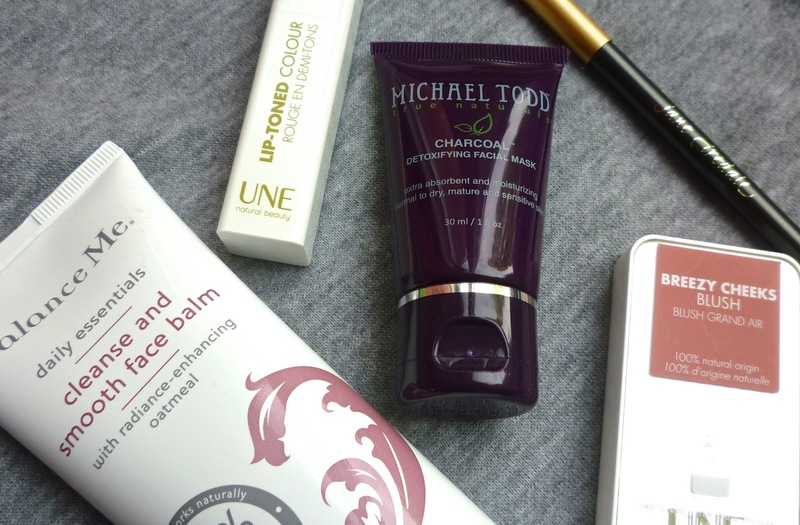 I love that charcoal mask and have been using a lot of Michael Todd products lately. They're great!